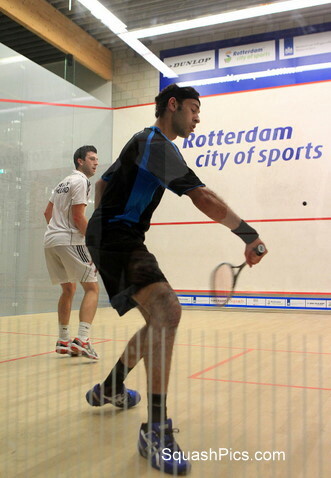 World junior champion Marwan El Shorbagy, at 18, the youngest player in the championships, caused the biggest upset in today’s second round of the PSA World Open in Rotterdam when he overcame England’s 11th seed Daryl Selby in a bitterly-contested 94-minute marathon to reach the last 16 of the premier PSA World Tour squash event of the year atVictoria Squash in the Dutch City of Sport. Marwan, younger brother of ninth seed Mohamed El Shorbagy, took the opening two games against the world No12. But British champion Selby fought back to draw level – then move 9-6 ahead in the decider. 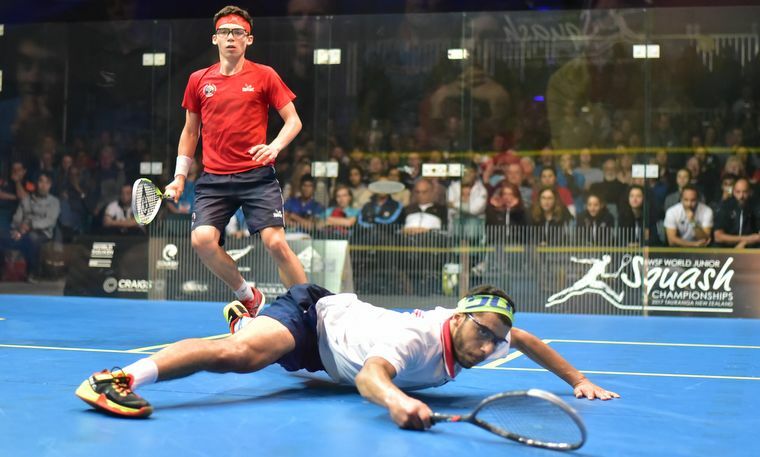 Both had match-balls – indeed Selby thought he had clinched victory at 11-10 – but it was teenager El Shorbagy who ultimately prevailed, winning 11-8, 11-7, 4-11, 4-11, 14-12 after 92 minutes. “I’m so pleased to have got the result here today,” said the ecstatic youngster from Alexandria. “It’s a massive thing for me to get to the third round in my first World Open. I can’t describe it. I feel I played very well tonight in the first two games, but my concentration maybe dropped in the next two and he got back into it. Marwan goes on to meet Selby’s England team-mate James Willstrop, the new world No3 who took just 13 minutes to reach the last 16 after his Canadian opponent Shahier Razik retired with an ankle injury with the score standing at 11-1, 4-1. 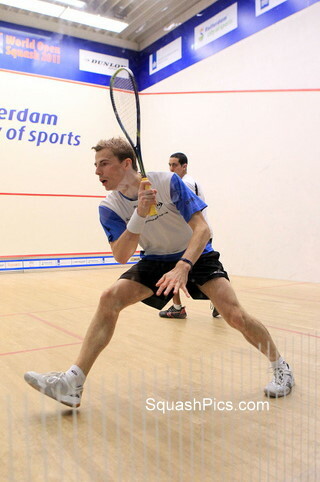 Meanwhile defending champion Nick Matthew made up for his shock defeat by Tarek Momen in last month’s Qatar Classic by beating the 23-year-old Egyptian 11-4, 11-9, 11-4. “There was a little bit of nervous anticipation today as Qatar was at the forefront of my mind,” admitted England’s world number one afterwards. “It was the last PSA match I’d had before this week and he beat me fair and square, convincingly, so I had to go away and do some research on him and come out with a plan to beat him on this court. “I was ready for a big match – I knew it was going to be tough. He’s very hard to play and he moves like lightning. But I was ready for him, pleased and relieved to get off court with a 3/0 – but even though it’s a good win, it’s only one round and we’re only in round three so there’s still a long way to go. Unseeded Spaniard Borja Golan pulled off another notable upset later in the day when he beat Omar Mosaad, the 14th seed from Egypt, 6-11, 11-7, 11-8, 11-7 in 76 minutes. The 28-year-old former world No10 is fighting back after major knee surgery – and is now celebrating his first appearance in the third round. At the end of a busy day at Victoria Squash in Rotterdam which features sixteen matches in each of the Men’s and Women’s draws, last word was left to another of the young Egyptians Nour El Sherbini, who celebrated her 16th birthday in style with a thrilling five-game upset over Australia’s 14th seed Donna Urquhart. The first two matches completed saw qualifiers Lauren Selby and Tesni Evans turn in creditable performances against Rachael Grinham and Samantha Teran, both having had a good tournament and doing themselves credit in today’s openers. Teran was happy too: “I’m happy to get started, and to have a tough game to get me ready for the next round, Tesni played well. It’s normally hard to adjust after the travel from Mexico, but I’ve been here a couple of days already and I feel quite comfortable, I’m in good rhythm and playing well. 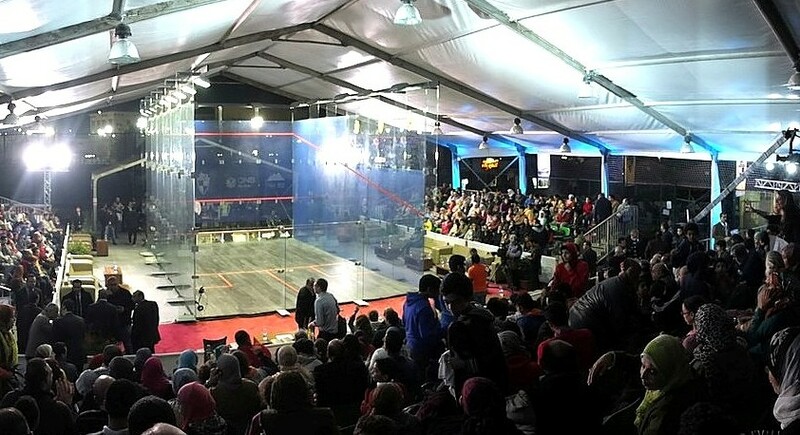 There was a huge upset in the next batch of matches as teenage Egyptian qualifierKanzy El Dafrawy ousted eighth-seeded compatriot Omneya Abdel Kawy in three delicately poised games, 12/10, 11/9, 12/10. Kanzy thought she’d won it when Kawy left a ball that the refs called in. Cue two disbelieving faces and a let was decided on, but it didn’t delay the victory for long. Another upset followed when Dipika Pallikal, who has just moved into the world’s top twenty, took out 14th-seeded Kiwi Jaclyn Hawkes in four games. “I started well then made too many errors in the second,” said the Indian number one. “In the third and fourth I was trying to be more steady and I thought I did that well. I played Jackie in Malaysia in July so I knew what to expect, you have to be prepared to run and run like she does. 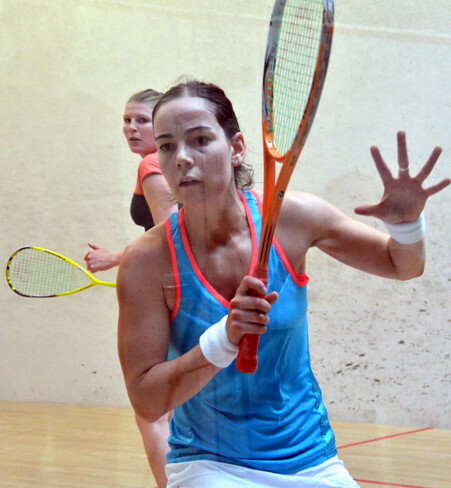 There were no further upsets in the afternoon session women’s matches, but none of Jenny Duncalf, Annie Au, Laura Massaro and Joelle King had particularly easy times of it even if they never looked in serious danger. 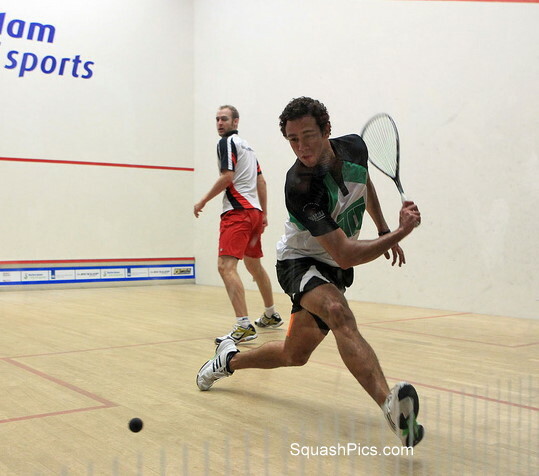 King now meets second seed Duncalf, who had just as tough a time of it against Line Hansen, coming through 11/9, 12/10, 11/7 in just over half an hour. Meanwhile Duncalf’s English team-mate Massaro managed to quell the lively young Egyptian Yathreb Adel 11/9, 11/7, 11/6 and she’ll meet Annie Au, who won her all-Hong Kong match with Joey Chan in four games. “We play each other so often, it feels strange to come all the way over here just to play each other again,” chuckled Au. In the evening session the ladies got their first outing on Victoria’s showcourt as locals Orla Noom and Natalie Grinham started their campaigns. Noom, who won the qualifying competition for the wilcard spot, performed well enough but Australia’s Kasey Brown was a tough opponent, and the sixth seed came through in straight games despite Noom’s best efforts and a noisy partisan crowd. 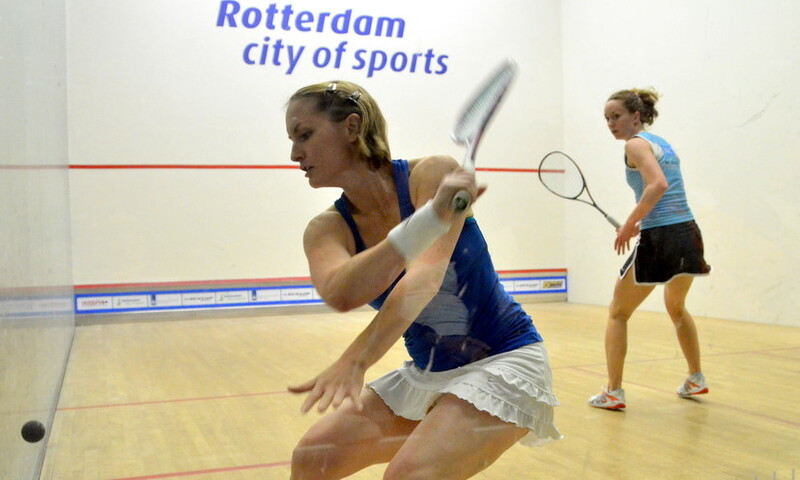 The following match, featuring four-time finalist Grinham against her qualifier training partner Aisling Blake, was one the crowd had altogether different expectations of, and they weren’t disappointed as the former Aussie who has just returned to the world’s top ten came through in straight games in front of her watching husband and son. Two contrasting matches followed. France’s seventh seed Camille Serme, having lost to one young Egyptian (Raneem) in Qatar was in no mood to lose to another today as she took a close first game against Nour El Tayeb, doubled her lead with more ease in the second and gratefully accepted the world junior champion’s retirement with an ankle injury at 2/1 in the third. Fourth seed Madeline Perry went two games up as well, but her opponent, Emma Beddoes, far from conceding stormed back to take the next two games. It was fairly comfortable for the Northern Irishwoman in the decider, who after an tough hour long match will be grateful for a day’s rest before she takes on Natalie Grinham at the Luxor Theatre on Thursday. Next up were Malaysian favourites on two courts. Low Wee Wern had to work hard to secure a three-nil win over US veteran Latasha Khan, while five-time and defending champion Nicol David started off her defence on an outside court against compatriot Delia Arnold. 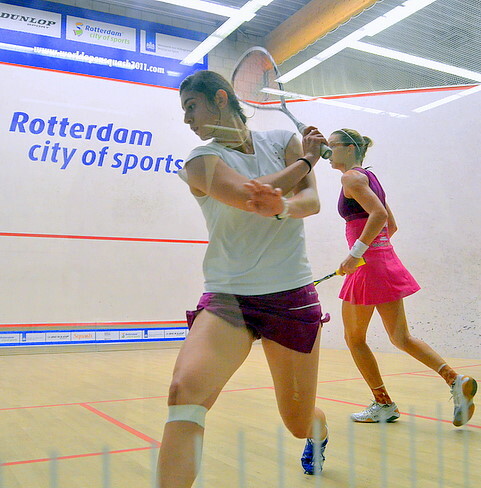 That left Donna Urquhart and El Sherbini, who took the lead 2/1 after saving game balls in what proved to be a crucial third game. 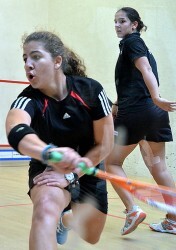 The fifth was a relative canter, the young Egyptian finally able to celebrate her 16th birthday with an 11/2 decider.